Fenway Park, Boston, August 17th, 2018. 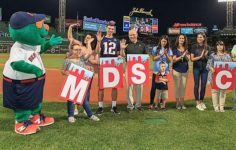 Join Special Olympics Massachusetts (SOMA) to celebrate Special Olympics Night at Fenway Park. All families, friends and athletes are encouraged to come together an celebrate while watching the Boston Red Sox take on the Baltimore Orioles. * Please keep in mind this is a regularly-priced event that requires a ticket purchase. For more information visit the Red Sox Special Olympics night page at https://www.facebook.com/events/423605678185951/.